A organized and realistic approach to the home buying process can help you steer clear of these common traps and mistakes, allowing you to not only cut costs, but also secure the home that’s best for you and your family. 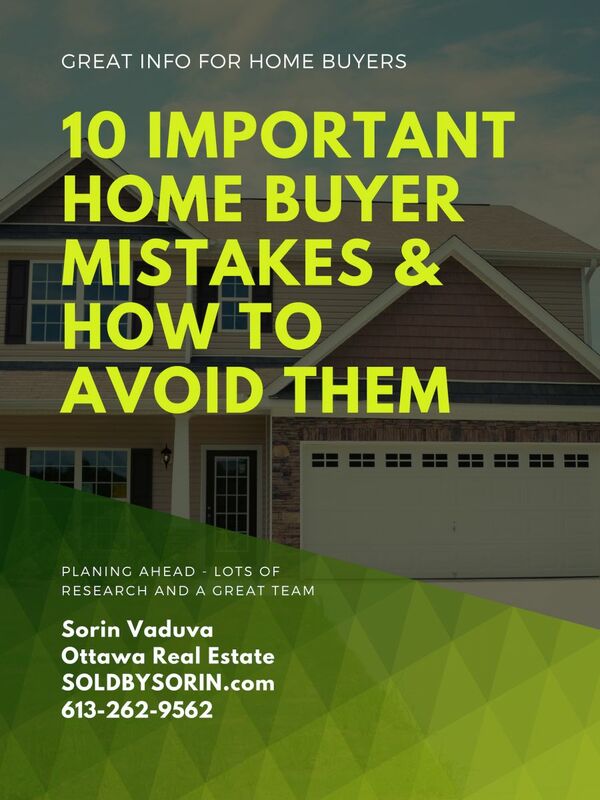 This important report discusses the 10 most common and costly of these homebuyer mistakes, how to identify them, and what you can do to avoid them. Make sure very early on in the negotiation that you will own your new home free and clear by having a title search completed. The last thing you want to discover when you’re in the back stretch of a transaction is that there are encumbrances on the property such as tax liens, undisclosed owners, easements, leases or the like. This is usally done by the lawyers after a deal is firmed up but with some homes that are estate sale or condo building then you can get a title search requested earlier in the deal. Don’t expect every seller to own up to every physical detail that will need to be attended to. Both you and the seller are out to maximize your investment. Ensure that you conduct a thorough inspection of the home early in the process. Consider hiring an independent inspector to objectively view the home inside and out, and make the final contract contingent upon this inspector’s report. This inspector should be able to give you a report of any item that needs to be fixed with associated, approximate cost. This is so important as there is so many things with a home that sometimes you can't see as a buyer and can be very costly if overlooked so this is a must. Pre-approval is fast, easy and free. When you have a pre-approved mortgage, you can shop for your home with a greater sense of freedom and security, knowing that the money will be there when you find the home of your dreams. In todays mortgage market where things are changing very quickly it is very important to know what you can afford and then even more importantly don't go up to 100% of your budget and try to stay around the 80% mark as you want to leave room for incase rates rise. If a seller fails to comply to the letter of the contract by neglecting to attend to some repair issues, or changing the spirit of the agreement in some way, this could delay the final closing and settlement. Prepare a list of agreed issues, walk through them, and check them off one by one. There is other ways to make sure that the sellers do the reapirs which is by adding a hold amount on closing in the case those repairs are not done. Make sure you identify and uncover all costs – large and small – far enough ahead of time. When a transaction closes, you will sometimes find fees for this or that sneaking through after the “sub total” – fees such as loan disbursement charges, underwriting fees etc. Understand these in advance by having your lender project total charges for you in writing. Some other fees that can add up: Moving costs, extra lawyer fees if deal is difficult, Tarrion Warranty Registration for new built homes just to name a few. We have all heard the saying “Location, location, location.” You can change all aspects of a house and even tear it down and rebuild a new one but you cant change the lot and location so make sure your very happy with it.How busy is the street during morning and evening rush hour to and from work? What is the crime rate in the area? If you take public transportation, is it close by the home? Is walkability important to you? What are the neighboring homes like, and how are they used or cared for? Nearby public parks, for example, are generally a benefit—but you might want to find out how busy they are with special events. As a first-time homebuyer, you may not be quite sure what you are looking for; a real-estate agent can help you think it through. Take your time during this critical part of the process, and insist on seeing all paperwork the day before you sign. Make sure this documentation perfectly reflects your understanding of the transaction, and that nothing has been added or subtracted. Is the interest rate right? Is everything covered? If you rush this process on the day of closing, you may run into a last minute snag that you can’t fix without compromising the terms of the deal, the financing, or even the sale itself. Before closing you should know eactly the amount to bring for the lawyers which will include : lawyer fee, downpayment, any adjustments for pre-paid taxes or city services. If you have any questions about this information or anything Real Estate Related I would love to chat with you and help in any way we can.